You might first notice that your fingers "fall asleep" and become numb at night. That usually happens in the evening because of the relaxed position of your hand and while sleeping. In the morning, you may wake up with numbness and tingling in your hands that may run all the way to your shoulder. What Happens in Severe Cases? You could end up with permanent muscle damage and lose function in your hand. So, don't put off seeing a doctor. Are Some People More Likely to Get It? Women are three times more likely than men to get the condition. That may be because in general they have a smaller carpal tunnel than men. When the condition is brought on by pregnancy, the symptoms usually clear up within a few months after delivery. Certain jobs that involve repeating the same motion with your arm over a long time may raise your chances of getting the condition. 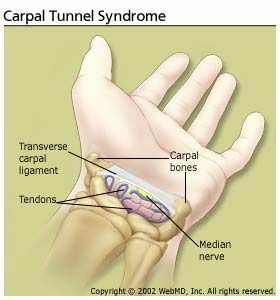 Which Tests Help Diagnose Carpal Tunnel Syndrome? Your doctor may ask you to tap the palm side of your wrist or fully flex your wrist with your arms completely extended. Another test called EMG-NCV measures the function of the nerve across the carpal tunnel. Lifestyle changes. If your symptoms are due to repetitive motion, you can take more frequent breaks or do a bit less of the activity that’s causing you pain. Certain stretching and strengthening exercises could help, too. Speak with your doctor. Immobilization. The doctor may have you use a splint to keep your wrist from moving and to lessen pressure on the nerves. You may wear one at night to help get rid of that numbness or tingling feeling. This can help you sleep better and give your median nerve a rest. Medication . Your doctor may give you anti-inflammatory drugs or steroid shots to reduce swelling. Surgery. If none of the above treatments work, an operation may be an option. Talk with your doctor about it. Use a splint or brace that helps keep your wrist in a neutral position. Talk to your doctor about exercises that may help. Correctly position your hands and wrists while working. Arrange your activity and workspace in a way that minimizes any discomfort.